GIS and Agent-Based Modeling: Call for Papers - Symposium on Human Dynamics in Smart and Connected Communities: Agents - the ‘atomic unit’ of social systems? Call for Papers - Symposium on Human Dynamics in Smart and Connected Communities: Agents - the ‘atomic unit’ of social systems? We welcome paper submissions for our session(s) at the Association of American Geographers Annual Meeting on 5-9 April, 2017, in Boston. By defining a social system as a collection of agents, individuals and their behaviors/decisions become the driving force of these systems. Complex global phenomena such as collective behaviors, extensive spatial patterns, and hierarchies are manifested through agent interaction in such a way that the actions of the parts do not simply sum to the activity of the whole. This allows unique perspectives into the inner workings of social systems, making agent-based modelling (ABM) a powerful and appealing tool for understanding the drivers of these systems and how they may change in the future. What is noticeable from recent applications of ABM is the increase in complexity (richness and detail) of the agents, a factor made possible through new data sources and increased computational power. While there has always been ‘resistance’ to the notion that social scientists should search for some ‘atomic element or unit’ of representation that characterizes the geography of a place, the shift from aggregate to individual mark agents as a clear contender to fulfill the role of ‘atom’ in social simulation modelling. However, there are a number of methodological challenges that need to be addressed if ABM is to fully realize its potential and be recognized as a powerful tool for policy modelling in key societal issues. Most pressing are methods to accurately identify, represent, and evaluate key behaviors and their drivers in ABM. We invite any papers that contribute towards this wide discussion ranging from epistemological perspectives of the place of ABM, extracting behavior from novel and established data sets to new, intriguing applications to establishing robustness in calibrating and validating ABMs. An abstract should be no more than 250 words that describe the presentation’s purpose, methods, and conclusions. 20th October, 2016: Abstract submission deadline. E-mail Andrew Crooks by this date if you are interested in being in this session. Please submit an abstract and key words with your expression of intent. 26th October, 2016: Final abstract submission to AAG, via www.aag.org. All participants must register individually via this site. Upon registration you will be given a participant number (PIN). Send the PIN and a copy of your final abstract to Andrew Crooks. Neither the organizers nor the AAG will edit the abstracts. 27th October, 2016: AAG registration deadline. Sessions submitted to AAG for approval. 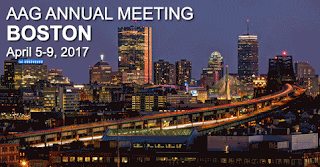 5-9th April, 2017: AAG Annual Meeting. Andrew Crooks, Department of Computational and Data Sciences, George Mason University. Paul Torrens, Department of Computer Science and Engineering, Tandon School of Engineering, New York University. Sarah Wise, Centre for Advanced Spatial Analysis (CASA), University College London.